Peerless will begin distributing product spring 2019 throughout the United States and Mexico. The new collection will be carried in better department stores and luxury specialty stores, alongside Robert Graham consumer direct channels. The product will be made in Peerless’ Canadian factory with a half canvas make and sartorial hand finished details utilizing the finest Italian piece goods. 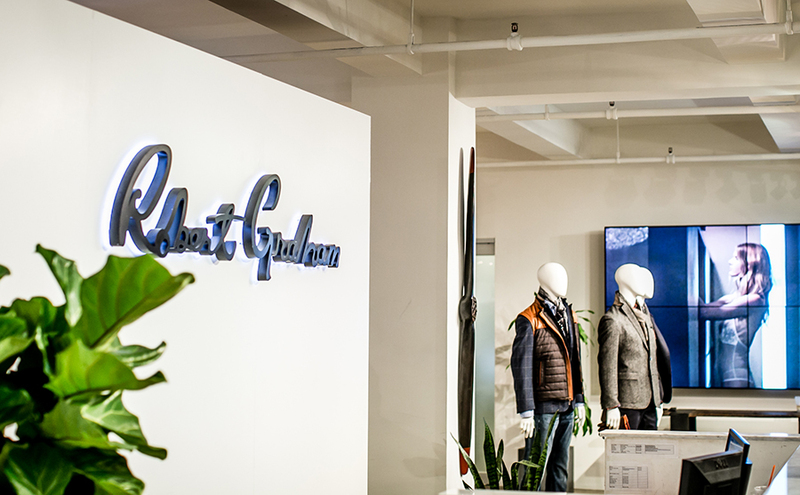 “We are thrilled to announce this new and very significant partnership which will strengthen the brand’s footprint and continue to create coveted luxury products,” said Andrew Berg, president of Robert Graham. This announcement comes on the heels of other signed partners including: Komar (loungewear), Nouveau Eyewear (ophthalmic and sunglasses), Prodigy Brands (footwear), and Royal Heritage Home (complete bedding and decorative pillows), reflecting the Company’s strategic focus on expanding Robert Graham’s lifestyle offering. Robert Graham already produces a wide array of men’s products under license with various companies, including: fragrances with Batallure Beauty, headwear with Henschel Hat Company, leather goods with RGA Leatherworks, and men’s dress shirts with Shirt Avenue. In addition, the Company has recently renewed two long-standing licensing relationships with: Throat Threads, a Canadian leader in the fashion industry, and British Apparel Collection, a leader in the luxury hosiery marketplace.